Home > Resources > Truepoint Viewpoint > Quarterly Insight > Volatility is Back, and That’s Ok. It’s Even Normal! As you are likely aware, in recent days the stock market has become increasingly volatile, exhibiting wild intra-day swings. The S&P 500 Index, which hit an all-time record high on September 19, 2014 is now down nearly 8% since the reaching that level. While painful, sell-offs should be expected by all long-term investors. What’s “normal”? To answer this, it’s worth revisiting one of our favorite charts which illustrates that on average, investors have historically experienced intra-year declines of 14%, almost twice as much as the current drop. But we put up with these roller coaster rides because we know that in the long run, the stock market has been more positive than it has been negative. 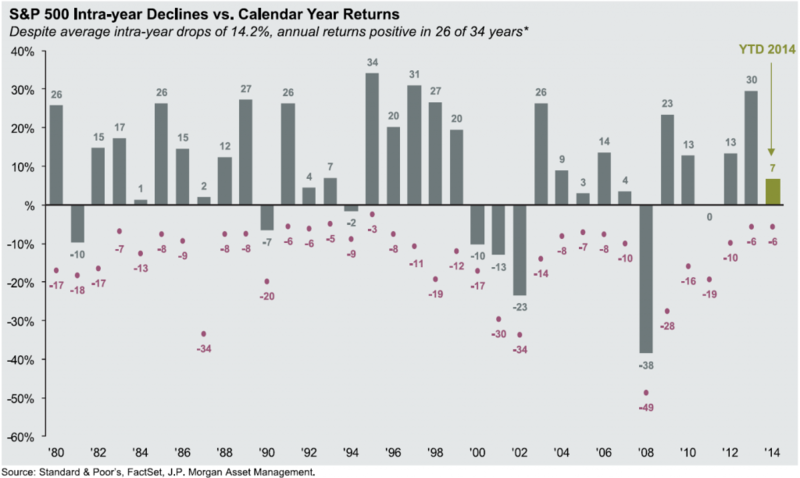 In the last 34 years, 26 have been positive – and that’s excluding dividends! This is not the global financial crisis of 2007-2008. The current situation bears no resemblance to 2007-2008. Unemployment has dropped dramatically, both consumer and corporate balance sheets are as healthy as ever before, and most importantly there is no systemic meltdown occurring in the banking sector of the economy. No pain, no gain. Since the S&P reached its bottom in 2009, excluding dividends the S&P 500 was up 192% through September 30, 2014. To earn these returns, investors have to be willing to endure volatility along the way. With fresh concerns ranging from geopolitical issues to Ebola, investors are likely questioning whether or not to “stay the course.” While the message may sound tired, now is when hearing that refrain again and again proves most valuable. Our investment philosophy is grounded in adhering to a long-term strategy of disciplined, real-time portfolio rebalancing to capture the opportunities of a fluctuating market. This discourages the urge to give in to the emotions of the moment that may prompt investors to take defensive measures. This emotional discipline is crucial to achieving long-term success. But you don’t have to go it alone, we’re here to keep you on the path we have chartered together and counsel you during stressful times when human emotions often get even the best of us. As always, please feel free to give us a call at anytime.